A solider had had a vigorous life and been wounded on numerous occasions. He had lost a leg, an arm, his shoulders and chest, been scalped and was minus his teeth, tongue and palette. In real life he was barely a head and a torso, in public however he was “that truly fine-looking fellow, Brevet Brigadier General John A. B. C. Smith” (Poe, 1950). 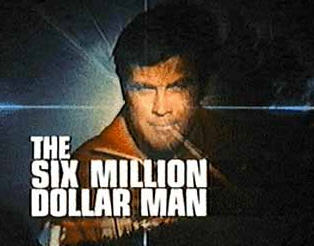 In the 1970’s the main character in a television series, The Six Million Dollar Man, was a crime fighter with many artificial parts; both legs, an arm and an eye that gave him if not superhuman powers at least pretty-good powers. This series was followed by The Bionic Woman, so as not to have any gender bias in replacement parts. Later a film was made about another crime fighter, RoboCop, with extensive new limbs and internal organs..
As we grow older we do wear out. Eye glasses and peg legs must have been the first artificial additions, but now we are mostly interchangeable. We can get ears (hearing aids), eyes (contacts), joints, limbs, hearts, lungs and other organs, new skin, various internal regulatory devices and quite a bit of reconstruction as needed. In fact it seems that the hip or knee replacement is almost a right of passage into old age. I’m not really sure what this all means. Certainly these man-made additions improve the quality of life of older people. They are expensive things however and for those without insurance or relying on Medicaid perhaps not readily available even if covered. I guess it may come back to balancing the joy of life against the pain of loss. There are losses as we move through life and each needs to receive its considered attention. Each illness and artificial part has a grief component. That may sound negative but looking on the bright side is only productive if you process the dark side as well. James, JW. The Grief Recovery Handbook: 20th Anniversary Expanded Edition. HarperCollins, February, 2009.